The exhibit will focus on the traditional Mexican Celebration which honors the lives of our departed loved ones and merging of popular culture style art of the 50s and 60s, it will bring for an exciting and unique show. The exhibit will remind us that the memories and images of our loved ones remain immortalized in our hearts and minds forever. Official after party at Brooklyn’s only Mechanical Bull Destination immediately following the show. 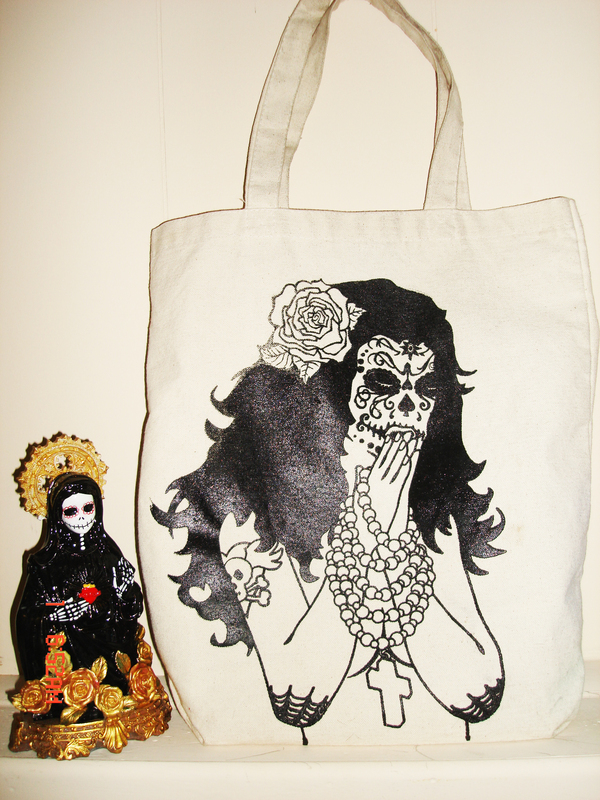 Come to this event and purchase yourself this AMAZING Dia De los Muertos Tote by Eddie Soto! I purchased one and it is my everyday bag! You can find this design on tops and tees as well at the Freshthetic shop. Eddie Soto is very talented, I am positive that this event will be worth going to, especially since he makes the most delicious cupcakes! He is the jack of all trades! I’ll be at this event dressed up in Dia De los Muertos fashion! See you there! ← Happy Halloween at Juliet/RDV !